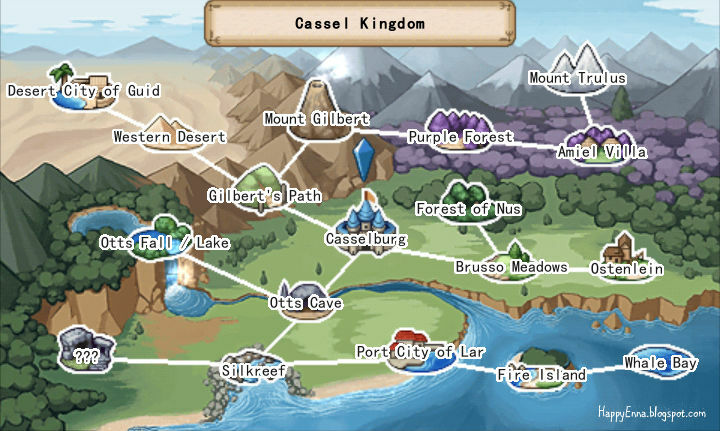 Here's a map of the Cassel Kingdom for Adventure Bar Story. You can see the name of each zone in the picture. Please click here to find out more about Adventure Bar Story. Hello, I was wondering how do you unlock Gilbert's path? Is it unlocked after Otts Fall/Lake or before? This is because I am stucked in otts fall and there is no where for me to go anymore. I think it's after Otts Fall/Lake. hello how to unlock the other map.? Yeap you are right, I got access to gilbert's path right after my bar ranked 5. Thanks alot for this wonderful guide. Very informative. guys how to unlock the last place? Hey, my bar is level six but I am stuck in otts cave-am I missing something? If you've defeated the otts cave boss, and walked out from the exit, maybe just try talk to everyone, and make more dishes. Some events are unlocked few days after you've done something, or after you've cooked some new dishes. Do you have any unsolved hints? Are you looking for Ottssie and Mad Ottssie? You won't be able to find Mad Ottssie in Otts Cave until you've defeated your rival -> helped healing the Queen -> Find a pickaxe -> Defeat Ottssie in Otts Fall/Lake. So in a few words, you'll have to come back later for it. Have you unlocked Silkreef? If you haven't, let me know, and I will try and make a map for you to find the first Otts Cave Boss - Goliath. I guess thats where I am stuck. I can't seem to find the boss in the cave. I am stuck going between a few rooms. I've seen you guide for the boss, I just don't know how to get there. Just made a new post. Hope it helps. Are there quest here.. a man ask me to look for misto plnt and i found one. But how about the axe how can i get that and the fishing rod?.. The golden box is in Otts Cave - the secret place behind the rocks. If you've just got the last place left you've probably got the box on your item list already. I’ve beaten the monster inside that “?? ?” place. Two circles appear. One of the circles is yellow and the other one is blue. When I step on the yellow circle, it says something,, like “you are not ready,.......” . What’s that mean? to find out where they are. Once you've beaten them, you can go into the yellow portal for a boss rush mode. :D Good luck! I have finish all monster all recipes but why I can,t go to??? Map? Monsters and recipes have not much to do with unlocking "???". What you need to do is to hand in the golden box to the pizza guy in the well. The golden box, also known as the puzzle box, can be found in Otts Cave. You probably have it on your item list since you've beaten all monsters. Bring the box to the pizza guy in the well, after feeding him enough pizza, he will solve the puzzle for you. He requires a few days to solve the puzzle. Keep going back until he finally solves it. I know this is kinda late~~but can you tell me how to unlock fire island? Hopefully I remember this right. To unlock Fire Island, you need to go to Port City of Lar. Talk to the people there. You might have to go back after a few days to talk to the people there again. Then someone will lend/rent you a boat to kill a monster. After you defeat the monster, you'll be able to go to Fire Island. Where is the 'well' that pizza guy live? What's the magical land of rat? It's Forest of Nus. There is a cave in that area blocked by a rock. It can not be removed until later in the game. There are two rat bosses hiding in the cave. I can't seem to unlock Whale Bay. What do I have to do to unlock that? I've unlocked ??? and beaten the boss there. Thankyou, I've unlocked Whale Bay! :) I've beaten the boss rush mode in ???. Is there anything else to do now? What do we do with those parts that are obtained from that black dragon at the end of the main story? And is there anything to be done about that guy in the cave in Gilbert's path? I only gave him a riceball and got the pickaxe. Nothing else. :D :D There isn't much left to do. After I did the rush mode, I just tried completing my secret catalog, cooked every single dish, collected every single item...etc. That's it really. After he left the cave, he never really came back again. For those who are lost about opening Whale Bay. Go talk to the guy in the lighthouse in Port City of Lar, he will tell you about Whale Bay & Whale Bay will get unlocked but this doesn't happen untill very late in the game. It opened for me after I beat the game (got the end credits) got max bar rank (rank 10 is max), got a gold crown next to bar rank (royal chief for king/queen). I'm playing the 3DS port of this game so not much is different. Hi Enna, I was curious about the part of healing the queen? And the blocked doorway in the ice cave. I'm stuck on both. I need the pickaxe and a sushi recipe that Alter recommends I sell as a popular dish! The Queen gets really sick after you win the cooking contest. You'll be invited to cook in the Castle. You won't be able to get a pickaxe for any blocked ways before the Queen's healed. I can't remember which one he recommended. Hello Enna, i hope you can help me. Firstly, i don't know why i can't participate in contests. Whenever i told the lady in blue : "YES" , she will tell me to wait for awhile for the news, when i continue, there was no news. I tried waiting for 2-3 minutes but still nothing. Is there anything i can do ? Secondly, it's already Month 6 reaching Month 7 soon and my shop only have 1 sliver star. Please help me and tell me how to increase my bar rank. I am guessing you spoke to the lady, and she asked "Are you participating in the contest?" and you said Yes. She then said, " Please wait a while for the results." Right after this, you should see a small area highlighted. Click on the highlighted area and select a dish to enter the contest. Click Ok. It will ask you "Entering Contest. Are you sure?" Select yes if you are ready. - Don't sale the same dishes all the time. Change your menu often. To get to the city of guid, you probably just need to rank up your bar more so the story will progress. what maximum level of character it 99? dragon fang dragon scale dragon wing can do something???? Yes, I think those are the material for making some special equipment. Remember the guy who gives you a pickaxe? He is a weaponsmith, and he can make you some nice equipment. Can you tell me how to unlock mount Gilbert? I have maximum bar rank (5 gold stars) but when I compete in the contest it tells me I need "4 extra points" to advance. That means I need one more high rank dish right? The only thing I don't have is dragon tung dishes but I don't have mount Gilbert yet. Advice? Am I wrong about the points? I have just been using my highest priced dishes to compete with (dragon risotto, fried dragon, deluxe pizza, mapo tofu and mapo eggplant). I have not cooked for the queen yet either - I think those 4 points are what are holding me up but am just confused. Thanks! This site is wonderful and has been a huge help. I'm so sorry for the late reply. I hope you have finally advanced on your own. So I guess you just need to do another contest, and win it before you can advance to the next level of contest. Every time, just before I join the contest, I'd save the game, and if I was unlucky and got 2nd or 3rd, I reloaded the game. :p You'll see different scores after a reload. Who can tell me why I unlocked the Whale Bay but desert city of guide doesn't be unlocked? I have five golden star and cooked for Queen. I think I have beaten the game. I wonder how to unlock desert city of guide. I read somewhere that Mount Gilbert would be unlocked after you helped with the first two items for the Queen's sickness ( tear of earth & cat fish ext ). Hope that works. In this case, you'll just have to wait until someone asks. It doesn't happen until later in the game. Ive unlocked gilbeert's path but 1 month i did'nt unlocked fire island, i wonder why? To get there, you need to hire a boat. Also you'll need to speak to someone in the lighthouse. The person that "lent" you the boat, and the lighthouse, both are in port city of lar. how to lent the the boat? the lender keep saying he lost at the casino again and has to eat a rice ball for dinner.. somebody say that we should make a cut scene with alter coming into the bar and announcing rumors of a sea monster. From there we'll able to pay the 5k for the boat and beat the boss to open up the island. but how to get that cut scene? Hi enna, i hope you could help me with my problem. I cant seem to unlock dessert city im stuck at western desert. My bar lvl is 10 character lvl 60+ and ive unlock all characters. The last cut scene witnessed was the queen was sick. But i didnt mind it and i just continued to open my bar. When the story reaches a point, Linda will come to you and tell you she can bring you to the city. That's when you can get to the city. The cooking contests also effect the story too. When I was stuck, I just farm things and make dishes, getting sales up, talk to different people. Sooner or later someone would show up and tell me what's next. Hope it is unlocked already. I was wondering if you could tell me how to unclock amiel villa,mt.gilbert & my. Trulus, and the purple forest? Those areas you mentioned get unlocked late in the game. You'll have to be close to winning the cooking contest, and have high bar rank. The story line is quite smooth towards the end. Once purple forest is unlocked, you'll be able to go to Amiel Villa, and they will quest you to go kill a dragon and so on. Please help me..how to unlock gilberts path....my bar rank is 9(4gold star and 1silver star) though gilberts path is not unlocked..
Hi Enna...may I ask on how to move forward onto the Queen's quest or any other quest beyond after gaining Fire Island and Western Desert entry? (Haven't got to the Dragon area at Gilbert path yet...unsure why) its been day 29 of 6th month (3 days after Fred stated the Queen is ill). My bar rank is 4 gold star (sales just made it) Need help!!! hi enna! im having trouble getting to fire island. my bar is rank six, and i cant get it to seven... also, when i enter the cooking contest, it always says ina popup box, 'sales of is needed to reach the next rank' or something, but theres never a number! help! oh...oops, did i put this in the wrong place? heheh....oops. how to getting fire island im so stuck, i already talk to all people in city of lar but i always got same reply. please help me, im already play 19 hours and im still in port city of lar =="
Is there some kind of time limit in this game? i mean like 'you have to finish this game before date ##' or something like that? Hi Enna!! please i need your help!!!!! How do you use the fishing rod? Enna . I have got misto plant , and kill the boss . After that I will do what?? Hi Enna i have a Question about the equipment's? Where to find the 049-Tathlum, 060-Silver Tray, 126-Master Ring. can you teach me where to find them? Please! that's the items i hardly looking to it. Please Reply and Help Please! Hi I have the golden box and I know where the pizza guy is that can open it but I can't seem to give him the box. If u can please tell me what I'm missing and how to get it.